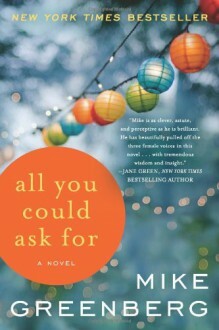 All You Could Ask For, debut novel by Mike Greenberg, cohost of ESPN's Mike and Mike in the Morning, is a tender and insightful story of friendship and love, heartbreak and renewal, played out in the lives of three unforgettable women.Brooke has been happily married to her college sweetheart for fifteen years. Even after the C-section, the dog poop, the stomach viruses and the coffee breath, Scott always winks at her in just the right moments. That is why, for her beloved, romantic, successful husband’s fortieth birthday, she is giving him pictures. Of herself. Naked.Newlywed Samantha learns of her husband’s cheating heart when she finds the goods on his computer.High-powered career woman Katherine works with heartbreaker Phillip, the man who hurt her early on in her career. Brooke, Samantha, and Katherine don’t know each other, but their stories are about to intertwine in ways no one could have imagined.And all three are about to discover the power of friendship to conquer adversity, the satisfaction of unexpected delights, the incredible difference one human being can have on other lives--and that they have all they could ask for, as long as they have each other.